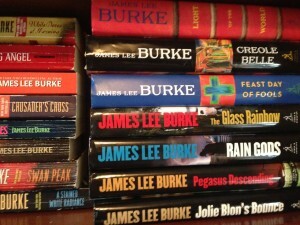 Currently I’m listening to James Lee Burke’s book Rain Gods for the second time as I commute from San Antonio to Houston to see family and write for my sister’s commercial real estate publication: RedNews.com. 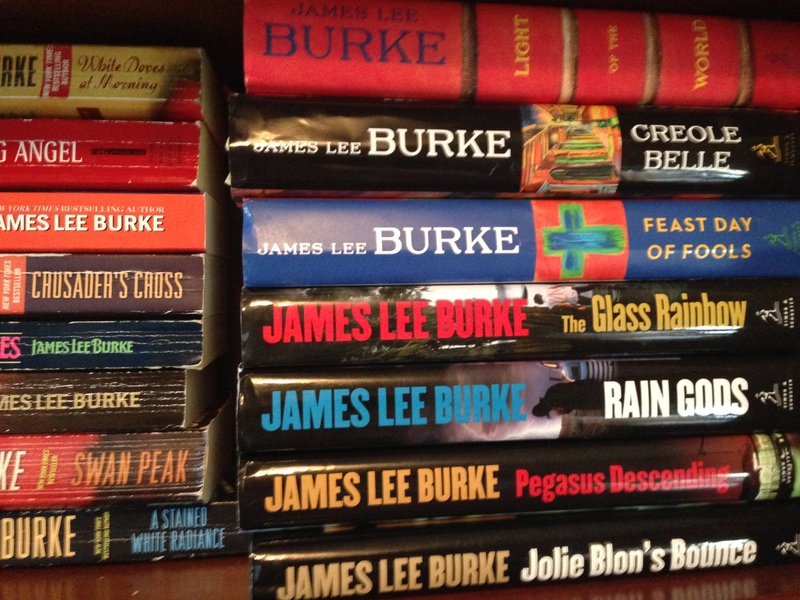 No doubt everybody in the entire world (except me) already knows that James Lee Burke has won two Edgars, written over 30 books, and has his short stories published in all of the best places. I picked up an audio copy of Rain Gods because Sheriff Holland was described as the sheriff of a tiny Texas town, which made me think of the tiny Texas town (Molly’s Point, Daughters of Memory) that my characters Macy Rose and Claire Louise Richards hail from. ‘Hm, this guy is writing about a sheriff in Texas; I have to read, well, listen to this!’ I thought. I’d heard that he was a good writer, I just had no idea how good the man was going to turn out to be! I began studying the mystery genre by immersing myself in the books of great mystery writers about 5 or 6 years ago when I decided to turn my characters from Daughters of Memory and Excuse Me for Asking into sleuths (Shade Island and McKenzie Trailer Park both as yet unpublished). Simultaneously (as I listen to Rain Gods during commuting time) I’m reading one of Burke’s Edgar winning books, Black Cherry Blues. Next on my ‘reading and/or listening’ list is Burke’s 30th novel, Feast Day of Fools. This book is a sequel to Rain Gods and features a truly great character: Sheriff Hackberry Holland. As I’m reading Burke’s books, I’m admonishing my own south Texas sheriff, Curtis Oates Junior, to listen carefully and take notes! Which reminds me of a great piece of advice for any writer: read, read, read, and write, write, write! Or we can take advice from Hemingway and just sit down at our typewriters (word processors?) and bleed all over the paper! I’ve read every book that Anne Tyler has written at least twice, and some of her books I’ve read many times more than that. My favorite Anne Tyler is The Accidental Tourist, but I like many of her other books equally well, so it’s hard to say why I’m calling that book my favorite. However, in all honesty, I haven’t been reading Tyler for the past year, because I’m writing a mystery right now and I firmly believe that you can’t write well in a genre that you haven’t totally immersed yourself in. Raymond Chandler invented the modern mystery, or so it is said. Everyone says read him and I have and he is good. He’s concise too, which I have a hard time being. I’ve read/studied all of Laura Lippman’s mysteries. Most of her books are set in Baltimore (as are Anne Tyler’s). The Baltimore locale is why I started reading Laura Lippman. Lippman’s books are also well-written, but some are significantly better than others. Because I live in San Antonio, I wanted to like In Big Trouble because of its San Antonio setting. Actually, I did like that book, but most of her later books are more complex/compelling. I love Lippman’s heroine, Tess, and what Lippman does with plot. I’m hoping to absorb as many of Lippman’s techniques to create suspense and tension in the plot as possible. Dennis Lehane is one writer I ‘discovered’ only after I saw the movie made of his book Mystic River. The movie is really good, but the book is one hundred times better! I’ve read all of his other books, except The Given Day, which I haven’t gotten around to yet. I’d recommend any of the books except Shutter Island, which is well written, but I hated both the premise and the ending. They made a movie of that book as well, which I haven’t seen. Kate Atkinson is also a favorite of mine. Her novels are so dense and her characters so well drawn that I love to read one of her books, and then listen to the novel on CD during road trips. The British accent of the book’s narrator stays in my head for days, as do all of the details Atkinson uses to delineate character. Currently I’m re-reading When Will There Be Good News? and re-listening to One Good Turn.